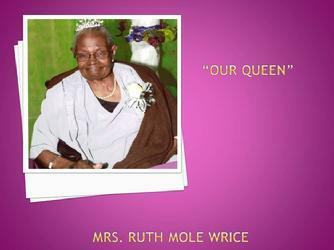 Sister Ruth Mole Wrice was born on November 16, 1926 to the late Mr. Joe Mole, Sr. and Mrs. Carrie Buckner Mole. She boarded the old ship of Zion on Sunday morning, 7:45 a.m., November 18, 2018 at her residence in Islandton, South Carolina, following an extended illness. Sister Wrice was united in Holy Matrimony on March 25, 1945 to the late Mr. Rudolph Wrice. This union was blessed with eight lovely children; one child preceded her in death. At an early age, Sister Wrice confessed Christ as Savior and became a baptized member of St. John Missionary Baptist Church, Varnville, South Carolina. She was also a member of O.E.S. Chapter, Smoaks, South Carolina. She was a mother not only to her children and grandchildren, but to family members and friends as well. Her home was always a welcome center of love and tender care. After working for many years, she retired as a dietician from the Cottageville Head Start Center. Mourning her departure yet cherishing fond memories are: (3) Very loving and devoted daughters: Shermenia (Milton) Mears of Islandton, South Carolina, Monalisa Rivers of Varnville, South Carolina, and Vyonnia (Corinthians) Williams of Walterboro, South Carolina; (5) Loving and devoted sons: Donald L. Wrice and Ronald E. (Beatrice) Wrice, all of Jacksonville, Florida, Clayso Wrice of Islandton, South Carolina, Lorenzo (Mary) Wrice of Varnville, South Carolina and Tony (Cynthia) Mole of Blackville, South Carolina; (18) Grandchildren, which includes a devoted grandson, Michael (Bay-Bay) Mears and devoted granddaughter, Kar’e Wrice; (38) Great grandchildren; A special niece, Francis Varns; A host of nieces, nephews, other relatives, and sympathizing friends.